Put-in-Bay has long been a favorite for meeting planners seeking a fun filled and unique environment where attendees are excited and looking forward to their next destination meeting place. Put-in-Bay features two full service conference facilities: the Put-in-Bay Resort & Conference Center and the Bay Lodging Resort, both offering catering, meeting space and organized activities to make any company meeting or outing a memorable one. We also have a brand new Waterfront Condo complex that is ideal for family reunions and smaller events, as well as the Island Club Home Rentals for multiple families. Put-in-Bay’s full time meeting planners and coordinators are available to assist you in planning your meeting or outing from start to finish including catering, meeting space, transportation and activities. For a hotel meeting, call 1-888-742-7829; and for a family reunion or relaxed event, call 216-898-9951. 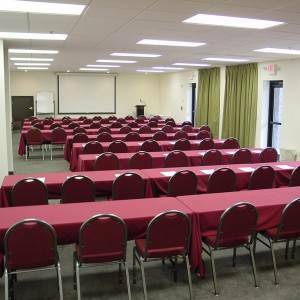 Put-in-Bay Resort & Conference Center is the largest full service conference facility on the island, able to host meetings and events for up to 450 people. Conveniently located just one block from the main strip and nightlife, the resort features 5 meeting rooms that can be booked separately or joined as needed. After the day’s productive meetings, guests of the resort can enjoy a large heated pool with swim up bar, the worlds largest Jacuzzi, golf cat rentals on site and warm comfortable rooms in many configurations including suites and 4 and 5 bedroom villas. Bay Lodging Resort is perfect for small to medium sized groups. Located just a few blocks from the main strip, Bay Lodging Resort offers spacious rooms and suites along with two bedroom units with full kitchens. Golf Cart rentals are available on site and the resort feature the island only indoor & outdoor swimming pool. Well known for it’s themed Buckeye Tiki bar, the Bay Lodging Resort is the perfect setting for your next corporate getaway. Put-in-Bay Waterfront Condos is brand new and features spacious 4-bedroom, 2-level Condos with fully equipped kitchens, satellite TV, decks overlooking Lake Erie, large patios with gas grills perfect for family gatherings, a large pool and pool deck, and golf cart rentals. Wi-fi is included and there is an elevator onsite for accessibility. The Condos have only received rave reviews since opening in 2016 with many repeat guests, families, and large groups! 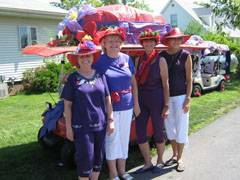 Come see why over 1000 groups and meeting planners return year after year and consider Put-in-Bay the place to meet!